On January 30, 2017, St. Louis, MO became the fifth city in the Midwest to pass a mandatory energy benchmarking ordinance. The “Building Energy Awareness” ordinance requires certain buildings to record annual whole-building energy and water consumption data into the free ENERGY STAR Portfolio Manager software. City-owned buildings will lead the way benchmarking in the first year under the ordinance. Privately-owned commercial buildings 50,000 sq.ft. and larger will need to comply by April 1, 2018. Both city- and privately-owned buildings will be required to report their consumption information each year thereafter. The ordinance passed unanimously in less than two months from its introduction, likely because St. Louis is no stranger to taking action to reduce energy consumption in buildings. The St. Louis High Performance Building Initiative was launched in 2014, which includes building benchmarking and goals of reducing energy consumption in buildings 25% by 2020. St. Louis is also part of the City Energy Project, a national initiative to cut energy waste in buildings in twenty US cities. 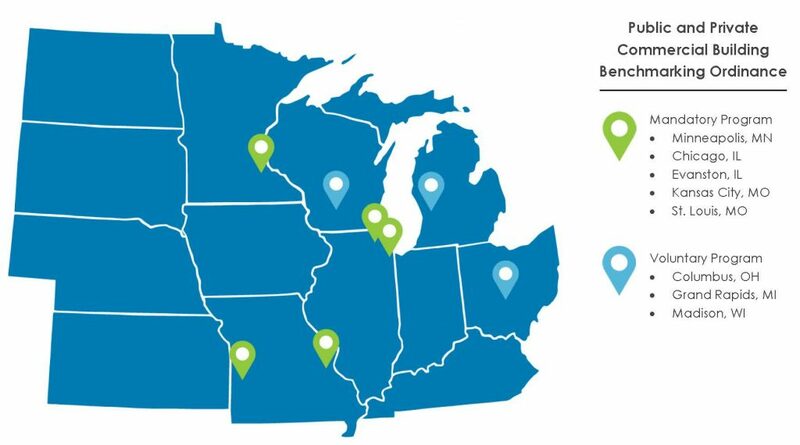 Cities across the nation continue looking to benchmarking ordinances to help achieve energy reduction goals. Benchmarking is the first step to achieving deep energy savings in buildings, which comprise around 40 percent of energy consumption in the United States.